I’m not saying it’s particularly new, or different. But some of the biggest impact backs this season have come from nowhere to dominate. Nowhere, like undrafted rookie Thomas Rawls from Central Michigan in Seattle; like late-camp signee Chris Johnson in Arizona; like 2014 fourth-round flyer Devonta Freeman in Atlanta; and like futures signee Dion Lewis, plucked off the street by New England as the Patriots went on their Super Bowl run late last season. Why, exactly, should teams spend big draft capital, or big free-agent dough, on a position that we've seen filled by spare parts on good teams time after time in recent seasons? Let’s look at what the best team in football over the first 15 years of this century has done in the acquisition business at running back. The Patriots have made do with two moderately priced free-agents (Antowain Smith, Sammy Morris), traded a low second-round pick for the last two or three prime years of Corey Dillon’s career, spent a third-round pick on an occasionally reliable one (Stevan Ridley), traded a seventh-round pick for one that had some big recent games (LaGarrette Blount, and then re-signed him when released by Pittsburgh last year), and signed two off the street in the NFL’s totally anonymous free-agent futures period—Jonas Gray and Dion Lewis, who is a big factor this season. The one mistake? First-round pick Laurence Maroney, who had a middling effect on the Patriots from 2007 to 2009. Without question, Maroney was overrated in the scouting process. Good lesson for Bill Belichick: You can find good backs in a lot of places; it’s a waste to spend first-round picks on them. That brings us to this year. Other than Matt Ryan and Dan Quinn and maybe Julio Jones, I’d argue Devonta Freeman is the biggest single reason why the Falcons are 5-0 entering Thursday night's game in New Orleans. (Spoiler alert: Emily Kaplan will tell you Freeman’s marvelous story on this site Thursday. She’s been in Flowery Branch, Ga., reporting his story this week.) Freeman and Chris Johnson of the 4-1 Cardinals are tied for second in rushing with 405 yards. You could have had Johnson for a song in July, when he was nervous and unemployed. Arizona GM Steve Keim got a wise bargain with Johnson in August. I’ve been most fascinated with the story of Rawls. Seattle quarterback Russell Wilson has been running for his life, and he’s been sacked a league-high 22 times. The line’s leaky. But here’s Rawls, an undrafted rookie who wasn’t particularly surprised by not being drafted, averaging a gaudy 5.6 yards per rush, 11th in the league with 326 rushing yards after playing, basically, three games in relief of the injured Marshawn Lynch. • THE FINE FIFTEEN: Where does Peter King rank Seattle this week? Rawls may take a seat this week, because Lynch’s balky hamstring is better. But what Seattle GM John Schneider knows now is if Lynch gets hurt again, he’s not going to have to look outside the organization for relief. Rawls is that guy. It’s interesting to note the similarities between Lynch and Rawls. Each weighs 215 pounds. 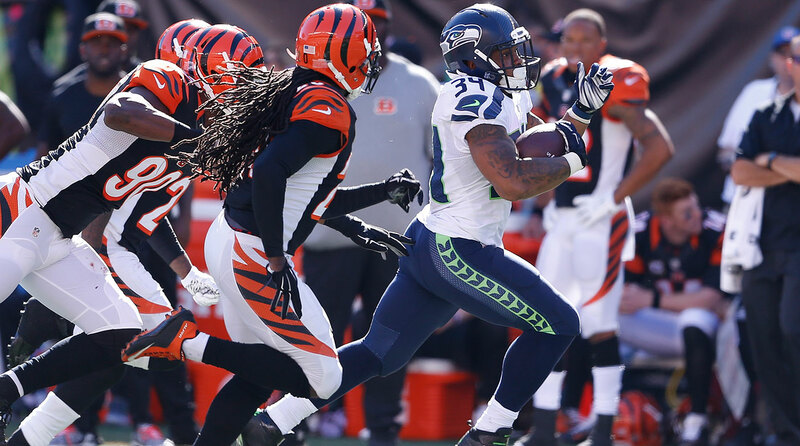 Each has a physical, pounding rushing style, and each has another gear when turning the corner—as Rawls did with a 69-yard touchdown sprint at Cincinnati on Sunday. In fact, in his final year at Central Michigan, coaches nicknamed him “Beast Mode” (you may have heard of that one) as he led the Chippewas in rushing. Rawls started his career at Michigan, couldn’t win the full-time running back job under Brady Hoke, and transferred to Central Michigan in 2013. After he sat out a season due to transfer rules, he played a season against Mid-American Conference competition in 2014. There’s another interesting facet to Rawls’ rise in Seattle. That’s his relationship with Lynch. He said when he first heard the nickname “Beast Mode” in college, he thought it was a joke. “There’s only one Marshawn, and I’m not him,” Rawls said. But when Rawls got to Seattle, he was impressed—no, amazed—with the amount of help he got from the guy who was number one on the depth chart. “It’s incredible how much Marshawn has helped me,” he said. Lynch is a human being with many angles. But you talk to teammates, and so many of them say what Rawls has said—he’ll coach you up, even if it means you may end up taking playing time from him. But as long as one of them stays healthy, it looks like Seattle won’t be able to blame a bad running game if the season goes south. Do you think Greg Hardy has a sense of entitlement? Finally reinstated and he chooses off-color comments about guns ablazing and Tom Brady’s wife. Then he shoots a video that does nothing to help his cause. From what I have seen in two weeks, I don’t think he has learned anything. Do I think he has a sense of entitlement? More than any player in football right now, yes. You can’t say the things that he has said and shown zero remorse the way he has done without believing that you are entitled. That is about the easiest questions that I will have to answer all year. Half the roster turned over from 2014, including the highest drafted QB in the Sean Payton era. Time to rebuild? If so, where do you think Drew Brees will play in 2016? Very interesting question. I’ve thought a lot about that. Before the season, team management believed Drew Brees was going to give them the best chance to make one final run at the playoffs. Obviously there are too many other problems for that to happen. So the logical thing is to move on and rebuild after this season. As to where Brees might end up… way too early to tell. First, he’s going to think that he is still a premier quarterback, and we won’t know until we see how he plays the rest of this year. Is there a team out there willing to pay Brees at the high level of what quarterbacks make when you are not really sure what he has left? I think some of this too depends on what other teams do with other veteran quarterbacks. Will Chicago stay married to Jay Cutler? What will the 49ers do with Colin Kaepernick? And will there be a general manager/coach combination desperate enough to think they are a good quarterback away from making a deep playoff run? Dan Snyder comes to mind. This is a question much more easily answered in January. Regarding Leonard Fournette, the NFL should allow any player to declare for the draft after their first year of playing (redshirting doesn’t count). If they have three years of eligibility left, they must be drafted, if at all, in the first round – otherwise, they return to school and remain eligible. If they have two years left, they must be drafted in the first three rounds or they return to school and remain eligible. If they have a single year left, they must be drafted in the first five rounds or they return to school. This would allow those players who are truly NFL-ready to move on, while creating a system that would keep more players in school and eligible until they are NFL-ready. That’s an interesting concept. One problem with it that I see is that the relationship between the NFL and college football is already fraught with problems. Some colleges resent the NFL for treating their teams like a minor league system for the NFL and are not very cooperative with NFL teams. Imagine if the best players on the best teams after their freshman year are preparing only for the draft and not for the next college season. Then imagine the same players, if not drafted in the first round after their freshman years, preparing for the draft again after their sophomore years. It's a yo-yo thing. I’m not saying your idea is impossible. but I am saying it’s going to drive a stake further into the already troubled relationship between a lot of colleges and NFL teams. Has any thought been given to expanding active game day rosters considering players are no longer allowed to play through concussions (nor should they be) as they did in the past? It seems like teams are becoming shorthanded rather early in games when players are put through the protocol. Every year, it seems, the NFL listens to some proposal about expanding game-day rosters. And it never happens. I am befuddled by the inaction. What gets me is that you are paying 53 active players on your roster, so what difference does it make if you suit up 49, 45 or 53. It’s madness. It’s stupid. It shouldn’t take a wave of injuries to try to convince people to have more bodies available on Sunday. I look at San Diego’s offensive line, for instance. On Monday night, they were down to five healthy bodies on the line. If one more guy got hurt, there could have been a debacle on the line. There could have been a situation where a totally ill-prepared player would have to play on the line in a nationally televised game. What is good about that for the sport of football? The NFL needs to expand the rosters for regular season games, and the NFL needs to do it now.